By the mid-1950s Roberto Rossellini, the iconic Italian Neo-Realist director of such cult films like Rome Open City and Paisan, was a spent force. His marriage to the legendary Hollywood actress of Swedish origin – Ingrid Bergman – was on the rocks and none of the projects he pursued took off. It was at this critical juncture that Rossellini met Nehru in London in the summer of 1955 and expressed his ‘dream to document India’s progress as a young, independent nation on film’. The erudite and flamboyant Prime Minister readily agreed and extended all help. Thus began Roberto Rossellini’s Indian journey that resulted in the most tumultuous events of not only his life but several other people who were associated with the project. Sonali Dasgupta, an elegant 27-year old Bengali beauty joined him as his scriptwriter in Bombay at the insistence of her corporate filmmaker-husband Harisadhan Dasgupta who wanted to network with the famous director. There was nothing in the bald corpulent 51-year old Italian that could appeal to women it seemed; but behind his workaholic, short tempered, idiosyncratic nature, there was a charmer that women found hard to resist. Sonali, a mother of two fell for this legendary charm, just like Ingrid Bergman who seven years earlier left her kids and husband and a successful Hollywood career to marry this eccentric egoistical man. And all hell broke loose. Dileep Padgaonkar’s meticulously researched and immensely readable Under Her Spell: Roberto Rossellini in India (2008, Penguin / Viking) traces the birth and the course of the relationship that became a national obsession. Russy Karanjia’s famous tabloid Blitz and Baburao Patel of Filmindia spearheaded the slander that marked an unprecedented high in yellow journalism. The Bombay film industry joined in the smear campaign and Sonali’s in-laws petitioned Nehru to rehabilitate her to her wronged husband. Nehru was disturbed by all the news but the two main players in the story – Rossellini and Sonali stuck to each other; she had checked in at a room adjoining Rossellini’s in Taj in Bombay along with her infant son, braving the media hound and plainclothes policemen who shadowed their every movement. Rossellini’s India project stood in danger of being aborted. Dileep Padgaonkar’s riveting account wonderfully delineates the growth of an introvert shy woman, unsure of herself, to a matured lady, packing it with all the elements that constitute high drama without being sensationalist. Sonali personally met Nehru and narrated her side of the story and her compulsions. Nehru and Sonali knew each other from Santiniketan where he was the VC while she was a student. Nehru fondly called her ‘Monkey’ and he could not refuse her entreaties. Her passport was promptly facilitated and M. F. Hussain who had become a close friend of Rossellini accompanied Sonali and her kid, acting as her husband, in a train from Bombay to Delhi from where she took a flight to Paris. Rossellini joined her later. Unfortunately, the feature film India Matri Bhumi and the series of documentaries that he shot in India are not regarded as a high point in his career and have no more value other than archival collections. 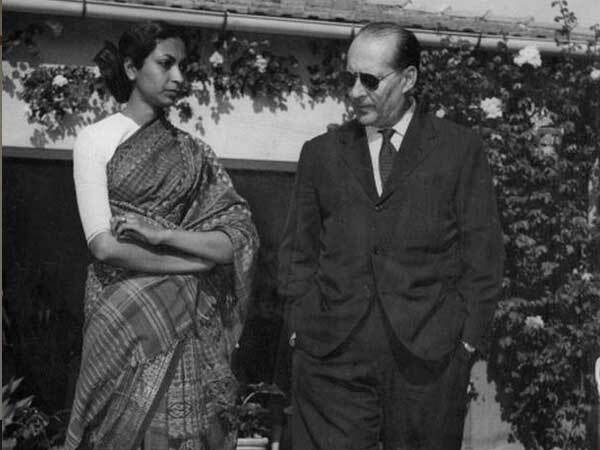 Rossellini and Sonali never married despite having a daughter and a son and by 1962 their relationship began to take its toll. He married again – his third, and Sonali set up a successful boutique in Rome, selling Indian products. Rossellini died in 1977. Sonali died in 2014 in Rome.